As one of the 7 wonders of the ancient world, visited by thousands of tourists every day, the Colosseum conceals myths and legends, it has a dark side to it, obscure and magical, known to but a few. Are you curious? Yes? Good! First of all, a bit of an historical background is called for, just enough to understand what this incredible monument is about. Its proper name is Flavian Amphetheatre because it was commissioned in 72 A.D. by Emperor Vespasian and later inaugurated by his successor Titus, who both belonged to the Flavi dynasty. In the old days it was first used as an Arena for Gladiator shows (but this you probably already know thanks to Ridley Scott’s famous film) as well as for other public events such as theatre shows recalling famous naval battles and hunting expeditions. Once the Western Roman Empire collapsed, it became an open air quarry to extract material for new buildings (quite frequent at the time). We must wait for Middle Ages to finally come across the name it is still known by today, Colosseum, because of its proximity to an enormous statue of Nero and the imposing structure. (colossal as we’d say today). With the divulgence of Christianity it becomes both a pagan and an imperial symbol and it is during this particular time that many legends begin to be heard about it, mainly promulgated by Christians who considered it a place of greed and perdition, thus history begins to be confused with myth. In deference to other important buildings of the city such as the Pantheon, it was never in fact transformed into a place for Christian cult and this only but strengthened its image as a stronghold of paganism. But let’s now turn to the darker side and… to the legends. In Medieval times it was thought that this was one of the seven doors leading to hell, probably a legacy from the gladiator fights. Indeed at the end of each bout a strange figure appeared dressed as Charon, the ferryman for the souls of the deceased to the world of the dead. He would use a red hot iron to check if the victim was dead and if so, he would carry him through one of the doors of the Colosseum, Libitina’s Door. Hence the legend. It was once thought that the paining souls of the deceased gladiators wondered inside the building. If you think the belief has now died down you are greatly mistaken. Every now and again someone says he has seen a ghost walking around in the cellars, even dragging heavy and noisy chains. Still in Medieval times, it was thought that some Evil lovers had built a temple inside the Colosseum dedicated to Beelzebum, a philistine divinity referred to in the Bible as the “Prince of all Demons”. According to the legend, in order to become members of the sect one had to answer the following question: Coliseum? Or, “Do you adore him (Beelzebub)?” Some believe the name “Colosseum” may have derived from this phrase. It seems that the poet Virgil, a Necromancer according to Medieval beliefs, would perform his magic rituals inside the building. It was also thought that in the XVth century, witches and sorcerers would meet here to prepare their magic potions with herbs that only grew in the grounds. The belief seems partly confirmed by the finding of some plants of non indigenous origin that these characters may well have used. The Prophecy of the end of the World. In a text by Bede the Venerable, an English Benedictine monk who wrote a number of historical books, there is mention of a prophecy according to which if the Colosseum collapsed so would Rome and then the World. The prophecy should mainly be taken as an allegory, a pagan warning against the eventual triumph of Christianity over the Roman Empire. One legend later to be amply denied has Emperor Nero sleighing the Christians inside the arena of this wonderful edifice. 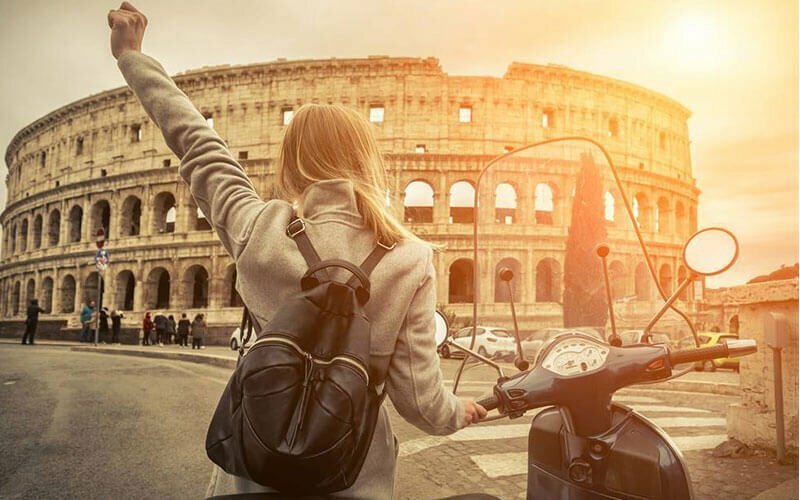 We hope to have kindled your curiosity, all that remains is to embark on a trip to Rome to decide for yourselves how much is true of the legends and magical of its history. Why not do so on board one of our modern chariots, Buzz or Vespa!